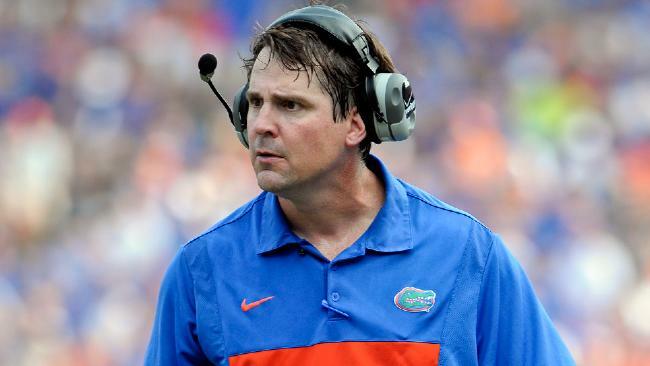 Will Muschamp will coach Florida in 2014, the question is who? Despite the Florida Gators finishing the 2013 season with a paltry 4-8 record, Florida AD Jeremy Foley continues to support head coach Will Muschamp. Foley is confident in Muschamp and his ability to return the team to prominence and overcome the rash of injuries and a seven game losing streak. However, not all of the Gators are buying into Muschamp’s system. Five players just announced they are leaving the program to play elsewhere to include sophomore tight end Kent Taylor, redshirt freshman fullback Rhaheim Ledbetter, offensive linemen Quinteze Williams, Trevor Young, and Ian Silberman. Though none of these offensive players saw significant playing time, with the five departures Florida will only have nine offensive lineman returning in 2014. This does not bode well for a team that ranked 106th in passing and 86th in rushing nationally. Foley’s impetus to retain Muschamp could be more about money than anything else. There is speculation that the university can’t afford to fire Muschamp. Muschamp earns approximately $3 million per year and if the school fires him without cause the buyout is valued at $8 million. For the 2012-13 season, the athletic department’s profits were approximately $15.5 million. It’s simple math. Firing Muschamp now would cost Florida over half of its net income. With Muschamp staying, are more departure looming?